The Psychologist returns to the festival. 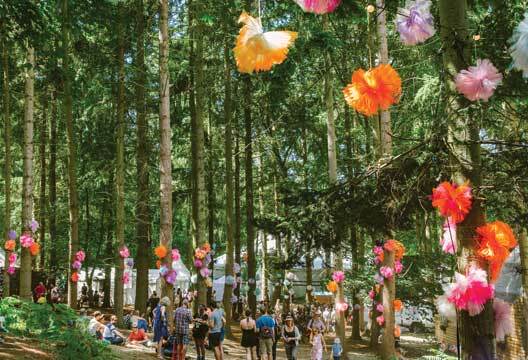 The Psychologist will be returning to Latitude Festival for the third year running this July, with an expanded programme. After hugely successful appearances in 2015 and 2016 with Professor Sarah-Jayne Blakemore and Professor Elizabeth Stokoe, we have organised two spots at the weekend of music and the arts, which takes place in Suffolk from 13 to 16 July. Both sessions are scheduled to take place in the Wellcome Trust Arena. First, on the Saturday, Professor Steve Reicher (University of St Andrews) will be in discussion with our editor Dr Jon Sutton on the festival theme of ‘revolution’, and specifically crowd action for social change. Much of psychology serves to keep us in our place. It tells us we are inherently unequal, that we are born to be greedy, selfish and competitive, and that we are naturally conformist. We just have to accept the status quo; resistance is futile. Yet the closer one looks, the more these claims fall apart. In particular, inspection of the classic studies of conformity show us that resistance is rife. So when do people adapt to the world as it is, and when do they band together in revolution? What ‘rules of unruliness’ can help us create a more disorderly world? On the Sunday, Society Vice President Professor Peter Kinderman will be in conversation around ‘a manifesto for psychological health and wellbeing’. Is it time for a revolution in how we think about mental health? Kinderman, author of A Prescription for Psychiatry, rejects the ‘disease model’, which views emotional distress as a symptom of biological illness. Instead he argues that mental health problems are fundamentally social and psychological issues – the products of how we understand and respond to the world. Instead of thinking about diagnosing and treating 'abnormality', Peter argues we should replace ‘diagnoses’ with straightforward descriptions of our problems, and shift away from the use of medication towards psychological and social solutions. In conversation will be Victoria Tischler, Professor of Arts and Health at the University of West London; and Dr Henrietta Bowden-Jones, a medical doctor and neuroscience researcher working as Consultant Psychiatrist in Additions, and the current Vice President of the Medical Women’s Federation. The panel will consider new and creative approaches to wellbeing. Should we rip up the manuals and move forward with a new manifesto? That additional psychological content includes Professor Simon Baron-Cohen on autism; Dr Kimberley Wade and John Higgs on false memories; and a session on mindfulness with Dr Willem Kuyken.